Greetings, Piedmont Opera customers. Opera Lively is proud to partner with this excellent company, and appreciative of Maestro James Allbritten's and Mr. Frank Dickerson's support, as well as Ms. Mariedith Appanaitis'. Bizet's great opera Carmen has been scheduled by our partners to be shown in Winston-Salem, NC, at the Stevens Center, on October 26, 28, and 30, 2012. Read the full announcement and ticket information [here] - individual tickets are already on sale. Opera Lively is putting together a series of eight articles on this opera, for those among you who want to learn a bit more about it. They are part of what we call our "Opera In-Depth" series. They really go deep, much more than what you usually find online, but they are accessible and fun to read. On the top right of this page you see a "widget" (a box with links) - depending on how you got to this page, it may or may not be already open, displaying the titles of the articles - if it's open, just click on the link to each Carmen article to have access to the full text. If the widget is not open, click on the + sign next to Exclusive Articles (attention, there's also an Exclusive Interviews link; you want the Exclusive Articles), then on the + sign next to Opera In-Depth Project, then on the + sign next to Carmen, and you'll find the links to the articles. The two Discography articles (audio and video) are under the same header, and the two on the musical structure (The Music of Carmen, and Carmen: Musical Structure) are also under the same header. Again, depending on how you got to this page, you may find previews of the Carmen articles by just scrolling down from this text. In this case, just click on the "read more" link after each preview, to have access to that article's full text. If you don't see previews below this page, then you have to use the widget as above. Attention: some articles are short but the Comments section below them have the continuation and in many case are also written by the article's author. This is just a feature of our software (when we add to the article, the additions go to the Comments section). A review of the show can be found [here]. 1. Carmen: The Genesis of the Opera - it talks about circumstances of composition, how the idea came to Bizet, addresses briefly the source material, and provides a detailed synopsis of the plot. 2. Carmen: Around the Opera - this article talks about trivia and curious facts around the opera such as reactions of the public on opening night, funny anecdotes, and many other interesting facts about this opera that you're not likely to find elsewhere. 3. Carmen: The Music of Carmen - this article is quite interesting to enhance the appreciation of the show, preparing the public to pay attention to some musical details during the performance. Don't miss this article! 4. Carmen: Musical Structure - this article develops a bit more the structure of the piece of a "numbers" opera that alternates sweet and harsh music quite often, becoming a true rollercoaster. 5.Carmen: The Characters and Their Voices - this article talks about the main singers who have tackled the four main roles in the past and present - Carmen, Don José, Escamillo, and Micaëla - and contains video clips! 6. 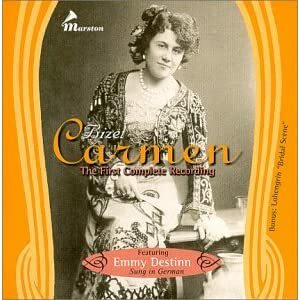 Carmen: Discography (audio) - this article is still growing, and contains reviews of Carmen CDs, as well as a complete list of the 211+ Carmen recordings. Come back periodically to it and you'll find more reviews. 7. 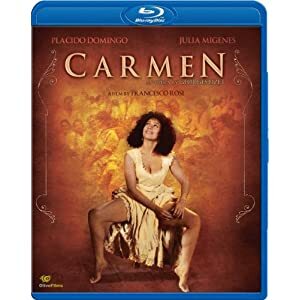 Camen: Discography (video) - again, it is still growing as we add reviews, and is for versions of Carmen on DVD and blu-ray discs. 8. Carmen: The Opera in the opera house - it contains comments on notable past and present stagings of this opera (also, more reviews will be added as they become available). Enjoy, and don't miss the show! Support your local opera company! Piedmont Opera brings to Winston-Salem world-class, first-rate performances and is not a touring company - its shows are done almost entirely locally; opera is expensive to produce (especially at Piedmont Opera's exquisite level of quality), and the company needs and deserves your help and continuous support. If you like what you see here and you aren't an Opera Lively member yet, make sure that you register as a member. It takes two minutes, is entirely free, and will remain forever entirely free. We don't try to push anything onto you and don't sell your information to anybody. You can read our files without being a member, but if you want to post comments and replies, you must be a member as required by our forum software. To register, just click on the Register button and follow the instructions. Even if you don't become a member, please explore what our site has to offer. The Forum tab will take you to a lively discussion forum with all sorts of topics including hundreds of reviews, material about singers, and even off-topic themes such as non-operatic classical music, films, etc. The discussion are very friendly, non-snobbish, and suited to beginners as well as experts. The Articles tab will take you to our journalist area featuring dozens of exclusive Opera Lively interviews with opera singers, conductors (there is one with Maestro Meena where he talks about Opera Carolina), composers, stage directors, educators and scholars, etc. Some of these names are quite famous, such as Danielle de Niese, Deborah Voigt, Joyce DiDonato, Thomas Hampson, Luca Pisaroni, Piotr Beczala, Anna Caterina Antonaccy, Anthony Roth Costanzo, Matthew Polenzani, Sylvia Sass, Vivica Genaux, Bryan Hymel, and many others (these are long and rich interviews) as well as two short interviews with Juan Diego Flórez and Anna Netrebko (the latter, ultra-short, but we're working on it; stay tuned, come back in October and you may find a surprise regarding the Netrebko interview). Scholar Philip Gosset's and stage director Thaddeus Strassberger's are particularly rich interviews in terms of understanding the innards of the opera trade. Only 20 interviews can be displayed on the Home page, but you'll find three times more than that (including Maestro Meena's - they do appear on rotating basis and Mr. Meena's was done last year - but it is still relevant and interesting!) by clicking on the widget line for Exclusive Interviews. Upcoming interviews to appear shortly should include Joseph Calleja, Samuel Ramey, and Saimir Pirgu (I say "should" because sometimes these things get cancelled or post-poned but we're pretty sure that these are coming). And then, we have other fun content like our Opera Deadly serial novel, our Once or Twice a Fortnight very erudit series, our Educational Area (operalively.com/learn), and our various local areas including under USA, North Carolina with plenty of local announcements and reviews. Enjoy, bookmark our site, and come back soon, hopefully as a member! - Bizet was a very precocious musical child prodigy. He was reading music at the age of four, played the piano very proficiently at age six, and at age nine he was able to play all Mozart sonatas from memory. He was admitted at a young age to the Conservatoire de Paris and won in 1857 the prestigious Prix de Rome. - Bizet married the daughter of one of his music teachers, composer Jacques-François Fromental Halévy, who wrote La Juive. - The circumstances around the opera's reception by public and critic at the time of its world premiere constitutes one of the greatest unfairness in the history of classical music. Bizet was rather proud of and optimistic about the qualities of his work - said that it was "all clarity and vivacity, full of color and melody," but the apathetic reception disappointed him so much that many musical historians attribute to his distress and depression an important role in the heart condition that prematurely took his life (at age 36), just three months after the opening. Shortly after that, Carmen started its journey towards becoming one of the most successful and popular operas of all time, and it is sad and ironic that Bizet did not survive to see its triumph. Carmen is a "numbers opera" with no written-through music but rather a collection of arias, duets, ensembles, and scenes structured in the work's original form as an opéra-comique, the French term for operas with spoken dialogue that are not necessarily comedic. In other versions like we've extensively discussed elsewhere in this set of articles, it contains recitatives - not composed by Bizet himself - linking the numbers. We start again another of our in-Depth series, with one of the most popular operas ever: Carmen, by Georges Bizet. 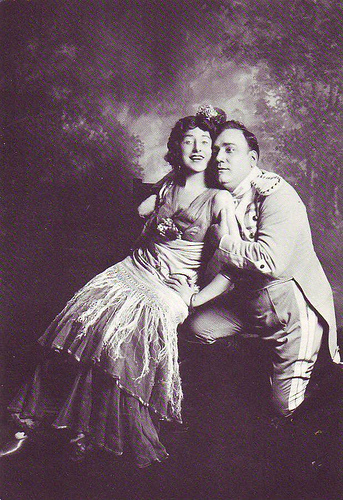 The first Carmen was the French mezzo Célestine Galli-Marié. A real character, she was every bit as impetuous and determined woman as the Gypsy herself. She was 34 years old at the time of the premiere, and was a very good match for Carmen both singing and acting, with her voice that was described as that of a high mezzo. OK, folks, I'll be reviewing the famous Rosi movie, considered by many to be the best version of Carmen on VHS - it used to be out of print and very expensive and now has been re-released on DVD and blu-ray. This article is to talk about some significant past and present stagings of Bizet's Carmen. It is part of Opera Lively's In-Depth series on Carmen. (We'll be happy to provide photo credits when known - in many cases below we couldn't find them, but we're using these photos in good faith as fair usage, in the spirit of publicizing the work of these artists). Carmen at Piedmont Opera: the Micaëla show!